The Viessmann Group is one of the internationally leading manufacturers of systems for heating, industrial energy and cooling. 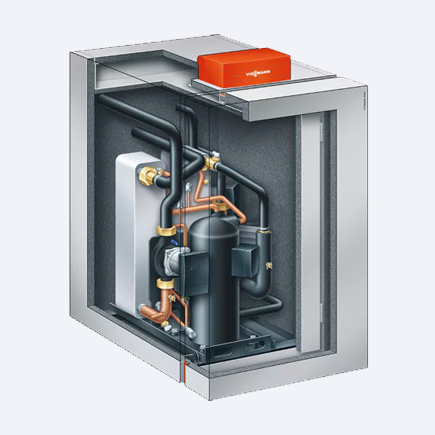 Viessmann's comprehensive heating range offers individual solutions and efficient systems with outputs from 1.5 to 120,000 kilowatts, for all application areas and fuel types. We provide the highest-quality Viessmann training, advice, support, service and installation service and have an in-depth knowledge of Viessmann products and can apply this to meet your needs. 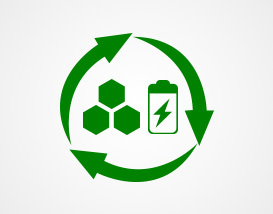 Systems based on fuel cell technology are ideal for use in new build detached or two-family houses as well as in modernised existing buildings with low heat demand. With their excellent performance characteristics, heat pumps can be used not only for new build and modernisation of residential buildings, but also for commercial applications. Advanced biomass boilers are suitable not only for convenient central heating of buildings and domestic hot water heating, but also for use in industry and manufacturing. We specialize in a variety of Viessmann Boilers. Below is a list of the boilers and heat pumps we work with. If yours is not on the list don't panic. 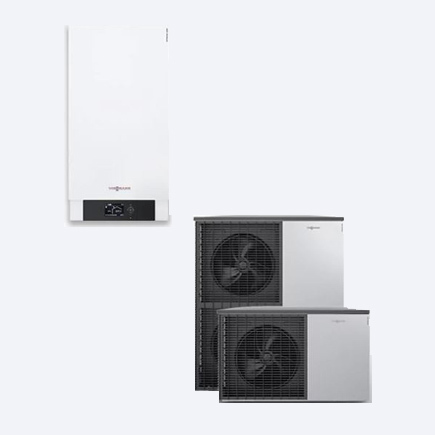 We are expert Viessmann and Stiebel Eltron specialists and if your boiler or heat pump is an old one, or is not on the list, that still requires servicing and maintenance we can do it for you. 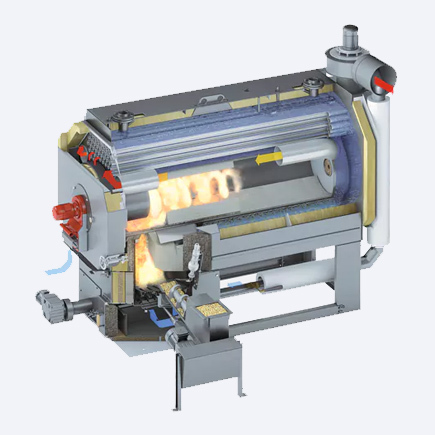 The Vitoligno 250-F can convert many forms of wood fuel into heating energy. If the wood boiler is equipped with automatic charging, the fuel is automatically ignited by an ignition fan. Combined with a DHW cylinder, this permits perfect low-load control (DHW mode in summer). The Vitoligno 250-F is suitable for manual charging with logs, wood briquettes, wood remnants with shavings and wood remnant pieces, as well as for automatic charging with pellets and chippings. The vertical heat exchanger surfaces are permanently cleaned by motorised coil springs. The drive mechanism is situated low down in the protected, cool gas flow. The springs can be removed easily for annual cleaning by the flue gas inspector. The high efficiency of the Vitoligno 250-F results from the long burnout path, optimum heat transfer, self-cleaning boiler passes and the utilisation of residual heat in the ash. In standard mode, the ash is automatically removed from the main combustion chamber into the front combustion chamber, where it remains until it has ceased to glow. The large hopper above the combustion chamber allows for convenient operation with logs. A simple push of a button is enough to change over to log combustion (patented air damper function). The Vitoligno 250-S was developed specifically for the combustion of logs and represents the very latest in combustion technology. The Vitoligno 250-S was developed specifically for the combustion of logs and represents state of the art combustion technology. The Vitoligno 250-S log boiler has already stood the test in thousands of applications. Charging from the top means easy handling, control via the Lambda probe guarantees low emissions and the integral heat management system ensures maximum convenience. The microprocessor controller records all data relevant for operation and regulates heat distribution. As a result, the boiler system is continuously monitored in all operating phases, from heat-up and operation under load, right through to burnout, and is held within its optimum operating range by motorised air dampers. This guarantees clean and efficient combustion. Thanks to its large charging chute, the Vitoligno 250-S offers great convenience during heating, whether with logs, wood briquettes or wood remnants, either in pieces or loose. Log boilers with a rated heating output range of 40 to 75 kW can be charged with logs of 50 cm in length. In the 85 to 170 kW range the hopper width increases to 1080 mm, allowing convenient charging even with logs of 1 m in length. 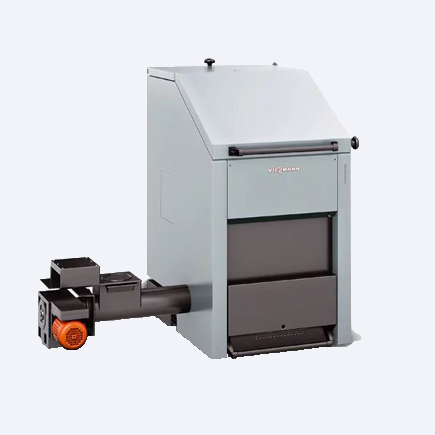 The Vitoligno 300-C is a fully automatic pellet boiler with a broad spectrum of use ranging from low energy houses to buildings with larger heat demands. 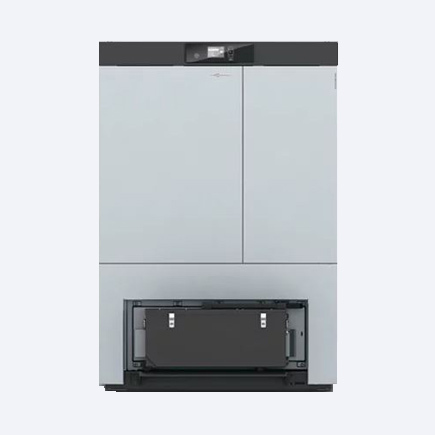 It offers versatile and flexible supply system options for almost any application and stands out on account of its compact design which is ideal for limited room heights. In the output range from 2.4 to 48 kW, the pellet boiler modulates with a ratio of 1:3 and features impressively low energy consumption. 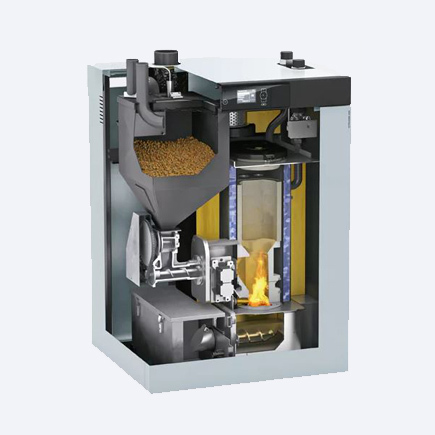 The Vitoligno 300-C has an efficiency of up to 95.3 percent when converting pellets into heat. Innovative combustion technology means the Vitoligno 300-C keeps dust values low and complies with the 1st BImSchV stage 2 [Germany]. 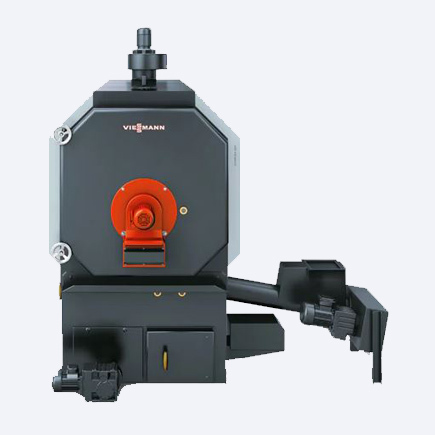 Operating the Vitoligno 300-C is extremely easy, making heating with pellets highly convenient. Almost everything is automatic – from charging with pellets right through to cleaning. Pellets are supplied to the Vitoligno 300-C either via a flexible screw conveyor or a vacuum system. Up to 12 kW, the boiler is equipped as standard with a vacuum system for automatic pellet discharge from the storage room. However, the versions with an output of 8 and 12 kW can also be converted from automatic to manual charging, quickly and easily. Commercially available bags of pellets can be used for manual charging, e.g. if there is insufficient space for a pellet storage room. The Vitoligno 300-H biomass boiler has been designed for great flexibility of use in the medium output range. This heating centre can be charged with either pellets or woodchips. A multitude of automatic functions make the Vitoligno 300-H particularly easy to operate. With its weather compensated Ecotronic control and a modulation range of 1:3, the Vitoligno 300-H tailors its performance exactly to suit the heating demand, resulting in low fuel consumption. Woodchips can be used with a grain size up to 50 mm and with a water content of up to 35 percent. The feeding of the fuel can be fixed either on the right or left of the boiler, providing flexibility and saving space for any installation. The Vitoligno 300-H biomass boiler is designed for flexible use with either pellets or woodchips, achieving outputs from 80 to 101 kW. 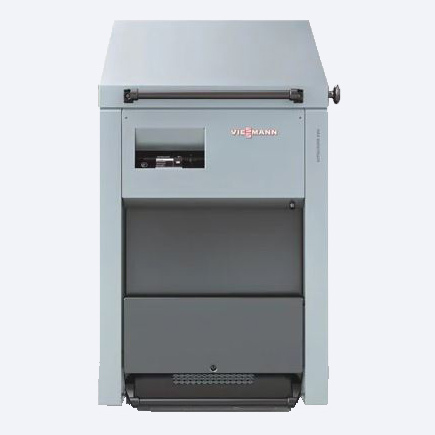 The medium power range boiler includes an efficient automatic ignition with lower power consumption and fully automatic ash removal from the sliding frame and heat exchanger. Thanks to its unique design, the upright heat exchanger enables less ash to settle in it, which makes for long intervals between cleaning. Emptying of the large, lockable ash box is nearly dust-free. The Vitoflex 300-UF wood boiler features high quality construction for use under the toughest conditions (high fuel flexibility from M10 to M50). The inside of the combustion chamber is lined with pressed fireclay bricks with a high clay content for greater durability. All grate elements are high quality, heavy gauge chromium steel castings that can withstand very high temperatures. 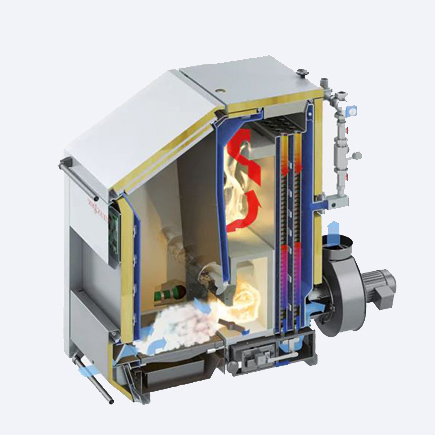 A distinguishing feature of the Vitoflex 300-UF wood boiler is its proven three-pass heat exchanger, providing maximum heat transfer and exceptional efficiency. The combustion technology of the Vitoflex 300-UF achieves low emission values (particularly for CO and NOx). Operation with modulating output control and the optimised combustion principle enables efficiency levels of up to 92 percent. 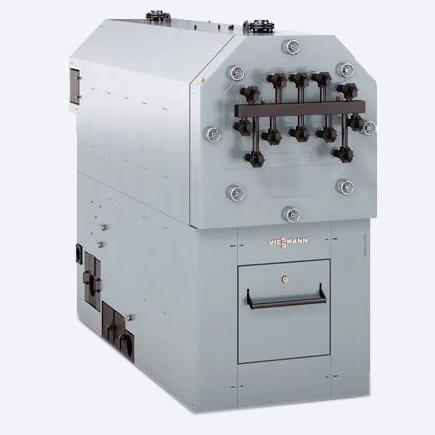 The moving infeed grate, proven combustion retort and sloping external grate in the Vitoflex 300‑UF optimally combine the benefits of infeed and underfeed combustion. A feed screw conveyor guides the wood fuel into the combustion retort, where it is pre-dried. The fuel is completely degassed on the external grate and the moving infeed grate. The wood gases are then burned with the aid of a regulated supply of secondary air. Vitoflex 300-RF wood boilers are available as containerised complete solutions for situations where there are no boiler houses available or where on-site building costs have to be reduced to a minimum. These ready-to-use solutions include a pre-assembled wood boiler inside a special container and all auxiliary appliances. Individual container solutions can be specially adapted to meet specific requirements. 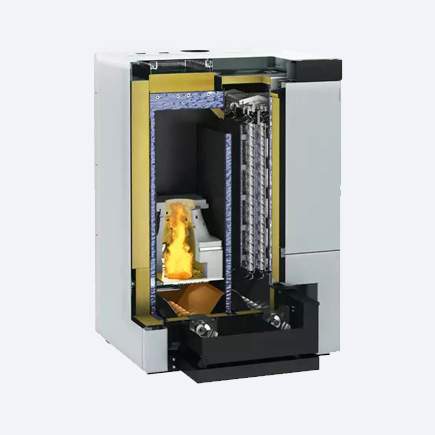 The proven combustion technology of the Vitoflex 300-RF achieves similar emissions values to those of an advanced gas combustion system and keeps the release of CO, NOx and dust particles to a minimum, subject to fuel type. The combination of combustion technology and digital modulating output control enables efficiency levels of up to 94 percent. 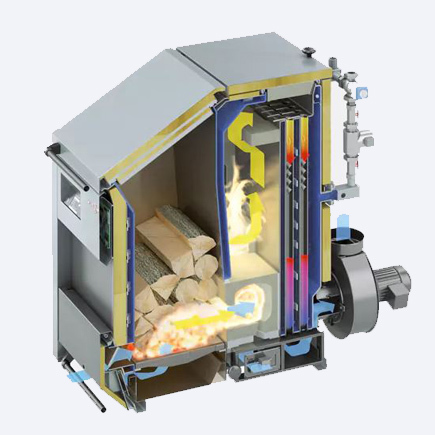 The patented rotation combustion system of the Vitoflex 300‑RF wood boiler is state of the art. A feed screw conveyor continuously conveys wood fuel onto a moving grate, where gasification of the fuel occurs (with Lambda regulated primary air supply). Continuous gasification occurs under air starvation. Rotary fans mix rising combustion gases with secondary air that has been atomised and subjected to angular momentum. This ensures thorough mixing with the combustion gases. A heat pump is top of the list for people who want to lower their energy bills and generate heat in a more environmentally responsible way. 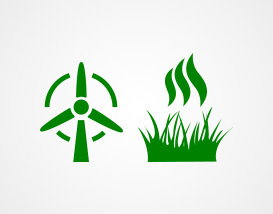 Heat pumps use renewable energy from the ground, sun, groundwater or air. 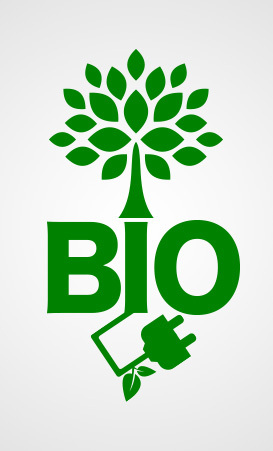 They lower usage of fossil fuels, conserve valuable resources and reduce environmentally damaging CO2 emissions. 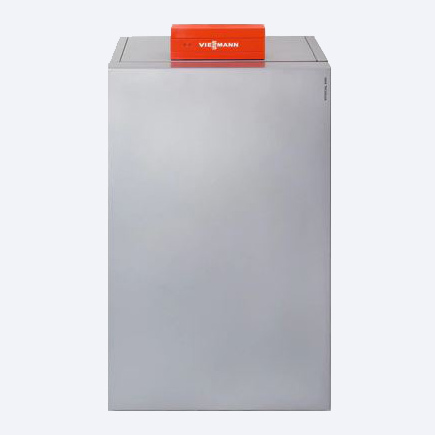 Viessmann heat pumps have the advantage that many of them feature active and natural cooling functions, along with their classic application as heat generators on cold days. In the summer they can keep the indoor temperature lower by bringing refreshing cool air into your house. 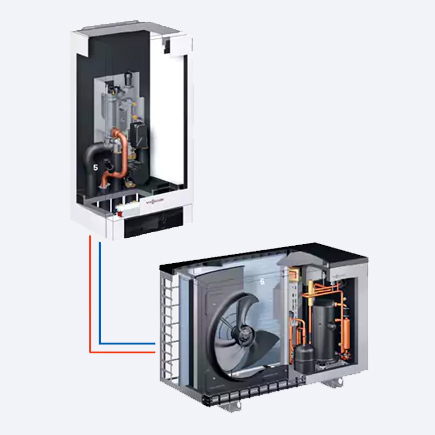 Viessmann's large range of products offers the right heat pump to suit every need. Even at the planning stage, structural and geological conditions, as well as personal and individual preferences concerning heat demand can be taken into account. 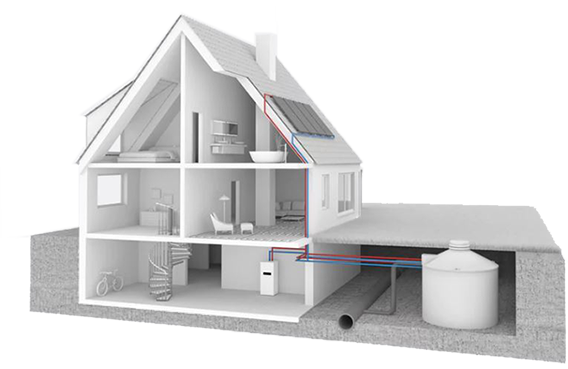 Viessmann heat pumps can be used in new build and modernisation projects, they can be operated alongside solar thermal systems and even combined with an existing oil or gas heating system to form a multi-mode system. This gives you plenty of options for implementing your own ideas or designs. Heat pumps today utilise ambient air, the ground or groundwater as their heat sources. The new ice store concept combines airborne and geothermal heat, and can also use insolation as a heat source. Vitocal 200-A heat pumps utilise the heat in outdoor air for environmentally responsible and cost effective heating. The monobloc unitis available for use either solely for heating (AWO-M), or for heating and cooling (AWO-M-E-AC). The outdoor units are very easy on the eye. These appliances are designed and manufactured in Germany featuring great performance, a superb finish and excellent product quality. Vitocal 200-A heat pumps utilise the heat in outdoor air for environmentally responsible and cost effective heating. When renovating your heating system, it is possible to add the heat pump as an additional heat source. In this case the existing heating system remains in place to cover peak loads when temperatures drop particularly low, while the heat pump covers the majority of demand. This significantly improves system efficiency. The Vitocal 300-A is the first air/water heat pump with digital scroll technology and an electronic bi-flow expansion valve. This means it achieves an extremely high Coefficient of Performance of 3.5 (air 2 °C/ water 35 °C) and therefore high seasonal performance factors too. 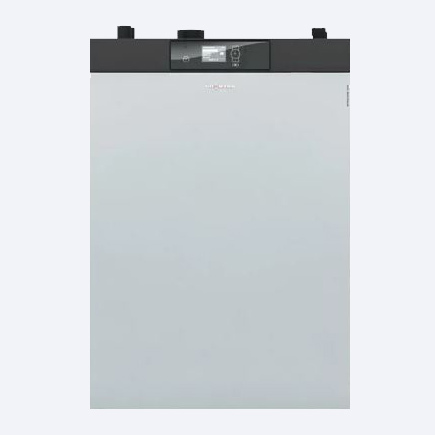 What's more, it accounts for the particularly reliable heat supply of the Vitocal 300-A, as well as providing significantly lower running costs. RCD stands for Refrigerant Cycle Diagnostic system. This is responsible for permanently monitoring the heat demand and the output made available by the Vitocal 300-A. It uses this information to match the two and can therefore achieve the highest level of efficiency at every operating point. Thanks to its reversible operation, the Vitocal 300-A can also be used for cooling. Convectors or surface cooling systems with cooling capacity of up to 8.6 kW give you the flexibility to make your living area even more pleasant. 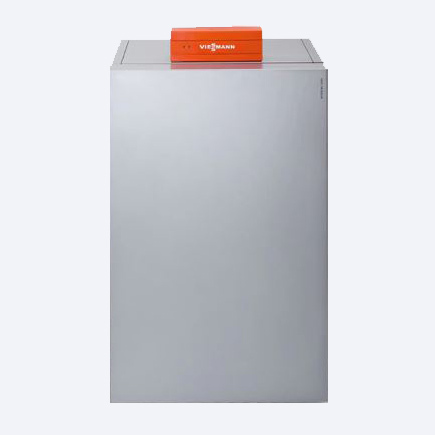 With its excellent price/performance ratio, the Vitocal 200-G compact ground source heat pump is ideally suited to detached and two-family houses. With its output spectrum of 5.8 to 17.2 kW in mono mode, it delivers a convenient heat supply all year round. 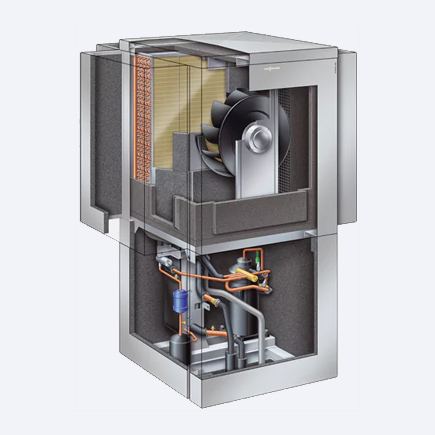 Thanks to innovative technology, including an efficient Compliant scroll compressor, the Vitocal 200-G achieves a maximum flow temperature of 60 °C and is therefore an affordable heat pump for a new build. The Vitocal 200-G is delivered complete with integral high efficiency pumps for the brine and heating circuits, a circulation pump for cylinder heating and a safety assembly. This makes it much more straightforward for the contractor to install. The natural cooling function is already included. To use this, an NC-Box from the range of accessories must be added to the Vitocal 200-G. The Vitotronic 200 can also be used to control the Vitovent 300-F ventilation unit, thus ensuring pleasant interior temperatures. As a ground source heat pump, the Vitocal 300-G draws thermal energy from highly efficient heat sources. For this, a geothermal probe, an ice store system or a geothermal collector is installed on the property. In all these cases, the heat pump covers the entire energy demand, even on colder days. As an alternative, depending on the location of the house, it may also be possible to utilise the thermal energy contained in the groundwater. 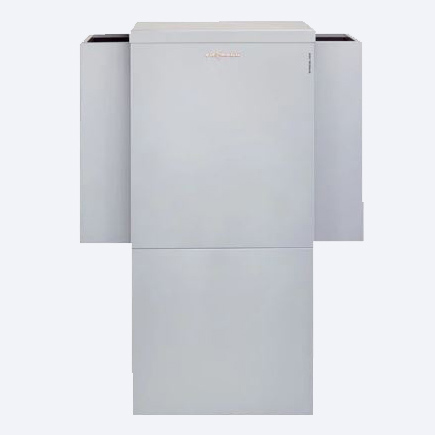 In this case, the Vitocal 300-G is simply configured for operation as a water/water heat pump. It can be used for new build and modernisation in detached houses and apartment buildings. The powerful Compliant scroll compressor fitted in the Vitocal 300-G heat pump is outstanding on account of its high operational safety, reliability and especially quiet operation. Essentially, this is due to the double sound insulation measures that include anti-vibration mounts to prevent structure-borne noise and insulation of the casing against airborne noise. At the same time, the compressor guarantees the highest coefficient of performance (COP up to 5.0) and flow temperatures up to 65 °C. The Refrigerant Cycle Diagnostic (RCD) system constantly monitors the refrigerant circuit in the Vitocal 300-G and, in conjunction with the electronic expansion valve, ensures the highest efficiency at any operating point, which results in high seasonal performance factors. For residential buildings with a higher heat demand, the two-stage Vitocal 300-G based on the master/slave principle is the right choice. It can also be configured for the ground or groundwater as the heat source. For this purpose, two heat pumps are linked together. This delivers the high heating output required and increases the operational reliability of the entire system. 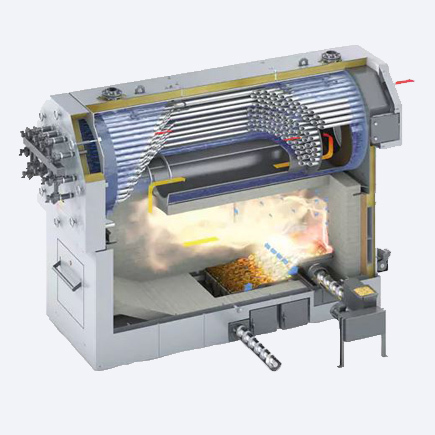 The modular layout, with separate compressor circuits, also ensures particularly high levels of efficiency in partial load operation, and enables the simultaneous operation of central and DHW heating. With five output stages as a master or master/slave version, various combinations can be realised and matched to the required heat demand. Because of this flexibility, systems can be configured so that runtimes match demand, thus ensuring economical operation. The master module regulates the slave module. Furthermore, the entire system can be equipped with high efficiency pumps. The list above are the boliers and heat pumps that we deal with regularly and there will be others that are not on the list that we currently have no information on. 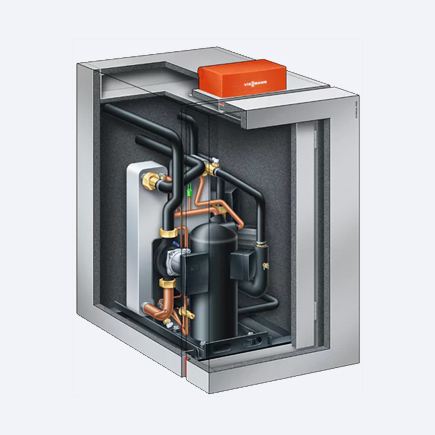 For info on other Viessmann products then please visit their website for more information.